10 Places to Catch Summer Sunrises and Sunsets in Raleigh, N.C. In the heat of summer, those who wake up early or use the evening hours to get outdoors reap gorgeous rewards. Aside from avoiding the hottest temperatures of the day, catching colorful, seemingly hand-painted sunrises and sunsets is an excellent motivator to get some exercise or do some exploring. Here are 10 places that you can capture a sunrise or sunset in Raleigh, N.C.
Join your special someone for a walk around Lake Johnson&apos;s three miles of paved greenway trails. Afterwards, head over to the Waterfront Center to grab seats in the rocking chairs overlooking the lake. If you plan it just in time for sunset, you&apos;ll really be in for quite the treat this summer as the sky&apos;s colorful reflection can be seen in the lake. Boasting more than 300 acres of rich landscapes and historic architecture, Dorothea Dix Park is located in the heart of Raleigh. Cozy up on a blanket to watch the sunrise in the park or start your morning off with a fun yoga session. The view of the downtown Raleigh skyline is incredible as the sun comes up over the glistening, tall buildings. Falls Lake State Recreation Area is a great spot in the City of Oaks if you&apos;re looking to relax and take in nature. Located on an undeveloped, 12,000-acre reservoir, Falls Lake offers camping, swimming, boating, hiking and biking. Enjoy the Mountains-to-Sea Trail at sunset for gorgeous views of the colorful sky and lake. Long considered one of the best restaurants or bars to catch a view of the Raleigh skyline, order a flight of delicious beer at Boylan Bridge Brewpub and grab a table on the patio right before sunset. 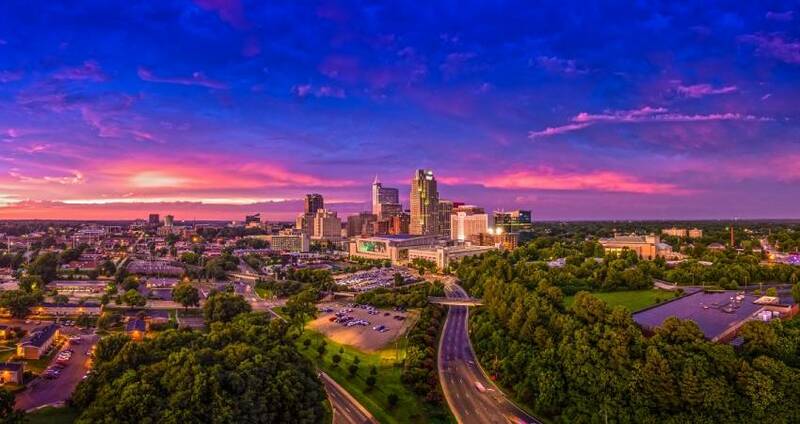 Sip on your locally-made beer as you watch the sky turn shades of pink, orange and purple with awesome views of the downtown Raleigh skyline as your backdrop. Hit the trails at Lake Crabtree County Park! With more than 16 miles of trails and beautiful views of Lake Crabtree, sunset walks are a must in the summer. Watch the sun go down over the lake and pack a few snacks to enjoy after your walk at one of the picnic tables or benches. Located on the North Carolina State University Centennial Campus and surrounded by a protected forest, Lake Raleigh offers a picturesque retreat for those looking to unwind. This 75-acre lake features a fishing pier and offers a boating ramp for kayaks and canoes. Bring your fishing pole and try your hand at catching a largemouth bass or catfish while you take in a stunning sunset. You&apos;ll also find stellar views overlooking the lake from the top floor terrace of the James B. Hunt Jr. Library. For all of you history buffs, a visit to Historic Yates Mill County Park during sunset is quite the experience. The centerpiece of this 174-acre park is Historic Yates Mill, the last operable water-powered gristmill in the area. Sit on a large rock near the mill and watch the sun go down while taking in relaxing sounds of the nearby stream. Covering more than 5,500 acres on the western edge of Raleigh, William B. Umstead Park offers trails perfect for a hiker and trail runner. A visit to Big Lake, the biggest of the three lakes within the park, wouldn&apos;t be complete without watching a sunset over the water—get there easily by using the Crabtree Creek entrance to the park (located off Hwy. 70) and following the signs to the nearby parking areas. Get your day off to a great start with a walk or run around Pullen Park, N.C.&apos;s first public park! Located just a few miles away from downtown Raleigh and on the edge of North Carolina State University&apos;s campus, this park is in a convenient location for visitors and locals. Sunrise is a prime time for a visit. Watch as the sun starts to come up over the pond and listen to the city wake up. For all of the cyclists, runners, outdoor enthusiasts and Instagram addicts out there, the Neuse River Greenway Trail, paved, 27.5-mile trail that many consider to be the gem of the Capital Area Greenway System, is a go-to place to take in a sunset. During the summer months you can catch views of rolling green hills, farmland and even sunflowers (when in bloom) as you enjoy the trails.